Members of the Hedgehog (Hh) family are highly conserved proteins that are widely represented throughout the animal kingdom. The three known mammalian Hh proteins, Sonic (Shh), Desert (Dhh) and Indian (Ihh), are structurally related and share a high degree of amino acid sequence identity. Each Hh protein has a unique expression pattern and distinct biological role within its respective region of secretion. All Hh proteins use the same signaling pathway and can substitute for each other in experimental systems. Shh has been found to have a critical role in development, acting as a morphogen in the patterning of limbs, brain structure, facial structure, lungs, spinal cord, thalamus and the teeth. Shh has been shown to attract commissural axons in the developing spinal cord by attracting or repelling retinal ganglion cell (RGC) axons depending on concentration. Murine SHH is frequently coexpressed with BMP2, BMP4, and BMP6. Biological Activity: Fully biologically active when compared to standard. 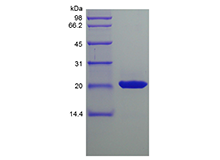 The ED50 as determined by inducing alkaline phosphatase production of murine C3H10T1/2 cells is 0.5-1.0 μg/ml.